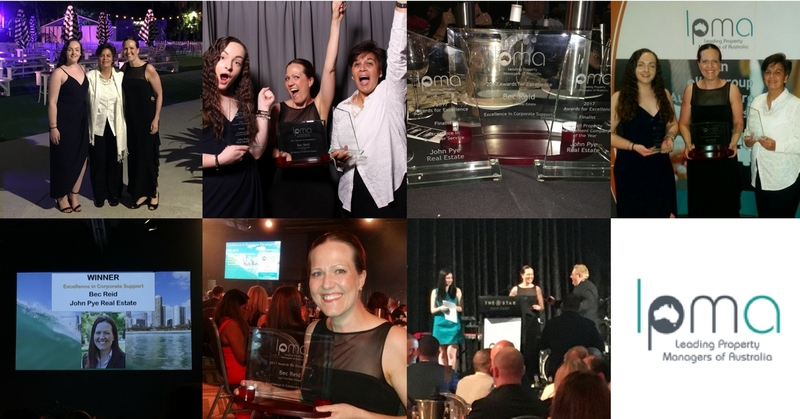 Last Thursday night, some of our team represented John Pye Real Estate at the Awards for Excellence Gala Dinner at the Leading Property Managers of Australia Conference. What a privilege it has been for John Pye Real Estate to be chosen as finalists among some outstanding companies around Australia! We are so excited to announce that WE WON the Award for Excellence in Corporate Support and chosen as finalists for Small Property Management Company of the Year – less than 500 homes & Finalist for Excellence in Customer Service. We have an outstanding team and a WIN for one of us is a WIN for ALL of us! We can’t wait to bring all the glassware home to our team to celebrate! For more photos and details of the awards go to our Facebook page or search #lpma2017 on social media. Do you know of anyone needing outstanding quality management services of their home or looking to change property managers for their investment property? We can handle the whole process pain-free with total ease. Allow our award winning team to show you how our vision, passion and performance can benefit you and your family.